Polar lights seen from the ground (source: University of California, Berkeley). In regions close to the polar circles highly dynamic polar lights can be seen regularly. They often move equatorward and exhibit many different colors. Such an event may indicate the start of a magnetic substorm, during which energetic particles are accelerated and move from the magnetosphere along the magnetic field lines into the upper atmosphere. During substorms records of the geomagnetic field exhibit very rapid variations. Substorm onset in the geomagnetic tail. 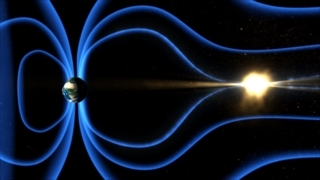 Magnetic field lines merge (reconnection), plasma is accelerated towards the Earth (source: NASA/Goddard Space Flight Center - Conceptual Image Lab). In order to enhance our understanding of the plasmaphysical processes causing a substorm as well as to ascertain its development in space, the THEMIS mission (Time History of Events and Macroscopic Interactions during Substorms) was selected by NASA in March 2003 out of 42 competing proposals as a Medium Class Explorer (MIDEX) Mission. It consists of 5 spacecraft, which surround the Earth on highly elliptical orbits, and numerous ground stations located in the northern parts of the United States and Canada. With their help the temporal course of events during a substorm is being investigated. The particle populations in the radiation belts, the direct solar wind interaction with the terrestrial magnetic field and its indirect interaction with the ionospheric regions constitute other areas of scientific interest. 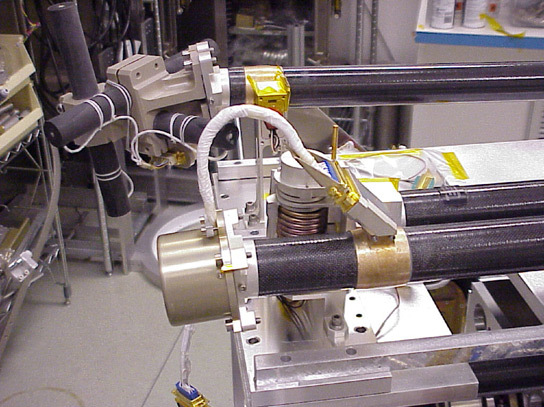 Sensor of the fluxgate magnetometer, encapsulated and mounted on the boom of one of the THEMIS spacecraft (source: University of California, Berkeley). The scientific payload of the five THEMIS spacecraft consists of a fluxgate magnetometer (FGM), instruments for the detection of low energetic particles (electrostatic analyzer, ESA) as well as high energetic particles (solid state telescope, SST), a search coil magnetometer (SCM), and an electric field instrument (EFI). One of the main instruments, the fluxgate magnetometer, was developed at the Institute for Geophysics and Extraterrestrial Physics of the University of Braunschweig. The calibration of the magnetometers was carried out in close cooperation with the Institute of Space Research in Graz. This project is financially supported by the German Bundesministerium für Wirtschaft und Technologie and the Deutsches Zentrum für Luft- und Raumfahrt under contract (Förderkennzeichen) 50 OC 0302. 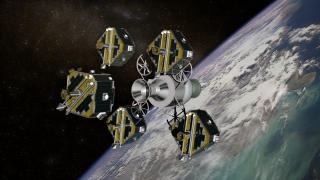 Separation of the THEMIS spacecraft from the launching vehicle (source: NASA/Goddard Space Flight Center - Conceptual Image Lab). Orbits of the mission main phase: THEMIS spacecraft aligned in the antisunward magnetic tail region of the Earth. The Sun is visible in the background (source: NASA/Goddard Space Flight Center - Scientific Visualization Studio). The five THEMIS spacecraft were launched from the Kennedy Space Center at Cape Canaveral (Florida, USA) on February 17th, 2007. Launch and separation of the satellites from the launching vehicle were carried out smoothly. In the first months of operation (the coast phase) the five spacecraft were flying in a row on a common orbit. 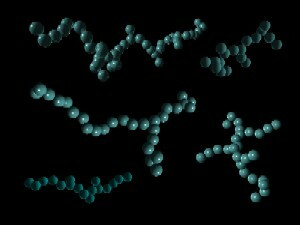 This string-of-pearls configuration has proven to be particularly helpful for the investigation of dayside wave phenomena occurring inside the magnetosphere and on its outer boundary, the magnetopause. 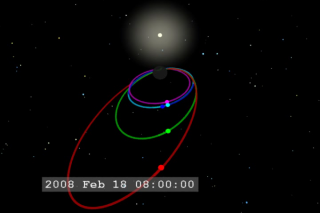 The injection of the spacecraft into their final orbits took place in September, 2007. In this main mission configuration the probes align themselves at their apogees with the THEMIS ground stations. This configuration is, hence, optimal for the investigation of the spatial and temporal evolution of substorms. At the end of mission a second major configuration change is planned: Two of the spacecraft may be injected into a stabile orbit around the Moon to research its interaction with the solar wind and the magnetosphere of the Earth.